Perhaps you know the story of the Clifton Project. They came together four years ago to revive the former Clifton Cinema, with imaginative plans to make it an amazing arts and entertainment space. They made a business plan, raised over £30,000 and built an army of 600 shareholders. But with the old Clifton site apparently sold, the plot appeared to lose pace – the core group of supporters have kept running their promotional stall in Wellington Market, and they have continued organising their successful pop-up film nights at the Belmont Hall. But what about the big project – a new cinema and performance space for Wellington? Is anything ever going to happen? Well if you’re one of those fidgety audience members who’s about to slink out the auditorium before the credits roll, stay where you are. Because the Clifton Project is back – with a new proposal for a new site – and they need as many local people as possible to re-engage and get behind them. 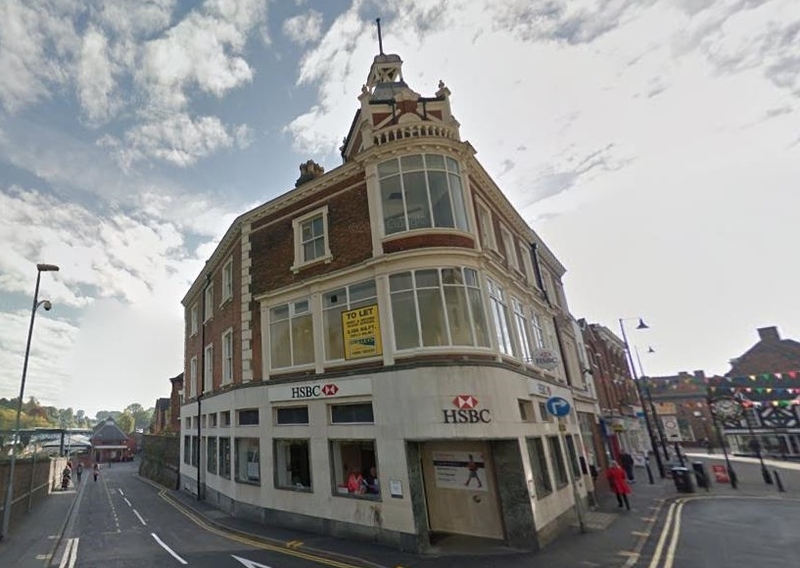 The former HSBC Bank – could this be a new cinema and arts space? It’s true, the Clifton Project still holds out hope of one day reviving the old 1930s Clifton Cinema in Wellington as a full-blown arts and entertainment venue. But with that building off the market and its future for the time-being unknown, they’re tired of sitting around and waiting. Good decision. With the approval of their community shareholders, the project board is now moving forward with a new, potentially much more achievable plan – to create their mini-cinema, plus performance / rehearsal space, café bar and maybe gallery – in a former bank right in the heart of the town on Market Square. HSBC closed its doors in the summer, and creates a brilliant opportunity for the Clifton Project to put their ambition into action on a smaller scale in an imposing building in a prime location. For those who aren’t familiar with the group, it’s worth pointing out that they haven’t just been planning / campaigning to secure an old building – for the last couple of years, they have also been showing films in an existing venue through a series of seasonal and themed programmes. They’ve had sell-outs. Through this work, they’ve been maintaining the interest and energy of their supporters, and crucially, they’ve been proving the case for a small cinema in Wellington which offers an alternative offer to the multiplexes at Telford Centre. And whilst this new site won’t have the large, professional theatre space they want, it will enable them to start hosting new sorts of live performance events, as well as providing rehearsal and studio space, along with the mini-cinema. For anyone interested in seeing Wellington raise its game this has to be an exciting prospect. And its more exciting still because it isn’t happening in a vacuum. News of the Clifton Project’s proposal came just a few weeks after Shropshire museum Mythstories announced their intention to take on another former bank in the town – Natwest, just across the other side of the churchyard. Taken together, these two projects – should they succeed – will start to radically improve the cultural offer in the centre of Wellington, and for the whole of Telford. Imagine, two attractive, vacant buildings transformed – one into a museum attraction, the other into a cinema and arts space, and just a hundred meters apart. And for those people wedded to the idea that all Wellington needs is ‘more decent shops’ – well don’t you think that two creative projects like this won’t raise the town’s profile and make this exactly the sort of place that great new businesses want to be? If these projects go ahead, it can only benefit residents and businesses. But these things don’t happen by magic. Mythstories are having to prove they have local support – and over 300 of you have given that support in the last month since my previous blog post (thanks!). The Clifton Project ALSO needs support – and more specifically, it needs to crowdfund enough money to enable it to sign a lease on the bank in the new year. HSBC doesn’t own the building, and they will want to lease it to someone who can pay something for it. Once secured, grant-making bodies will start to take an interest (the lease would be long enough for grant-makers to commit). But the project needs to be in the building first. So how can you help? You can join the 600 shareholders who already have a stake in this project, or you can make a donation (the government is currently matching charitable donations up to £10 under the Grow Your Tenner scheme). And even if you don’t want to give any money, you can just vote for the Clifton Project on the Aviva Community Fund, which could help them get a share of financial support from Aviva. For information on all these options, follow the links in the text or visit the Clifton Project website here – and do it today! If we all left it to someone else to make the difference, nothing like this would ever happen. And if it does happen? That would be a wonderful thing. DO YOU SUPPORT THE IDEA? PLEASE TELL US BELOW! YOUR ONLINE FORM WILL GO STRAIGHT TO THE CLIFTON PROJECT. THE MORE SUPPORT THEY HAVE, THE STRONGER THEIR CASE TO FUNDING BODIES. http://www.localgiving.org/charity/the-clifton-community-arts-centre-ltd (this scheme finishes on Thur 17th Nov or when the funding is all allocated!). Lastly anyone interested in the Clifton project is very welcome to come to the next supporters open meeting on Tuesday 15th Nov at 6-30pm at the King Street cafe in King Street, Wellington. This exciting project could really help regenerate Wellington Town Centre. Just a quick update on a couple of the fund raising schemes. The Aviva voting scheme is going well and the Clifton is now top of the 12 Telford projects and may get some funding from this. The voting closes tomorrow Fri 18th Nov, so please vote if you have not done so yet! The Government ‘grow your tenner’ scheme is great opportunity to get funding for the project and this scheme has now been extended until Mon 28th November, so please ‘Wellingtonians’ donate £10, which (with gift aid) becomes £22-50 for the Clifton project. Just go to http://www.localgiving.org/charity/the-clifton-community-arts-centre-ltd and donate a tenner to help this project get the lease for the HSBC bank building. The Clifton share offer is also open and anyone can buy shares (from £10) via the website http://www.theclifton.org or get a share booklet from the Clifton stall at Wellington market on Saturdays.